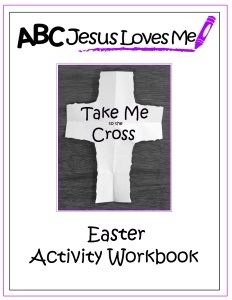 Available to all Our Out-of-Sync Life blog subscribers during the Easter season, this seven-day countdown Easter Activity Workbook has the purpose of pointing children to the cross and understanding the salvation that comes from it. 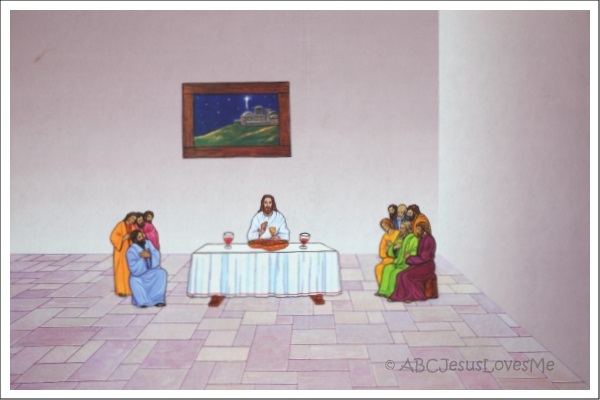 View ideas for specific Bible stories used in the ABCJLM curriculum. Each link includes ideas such as corresponding books, verses, songs, poems, activities, printables, and crafts. 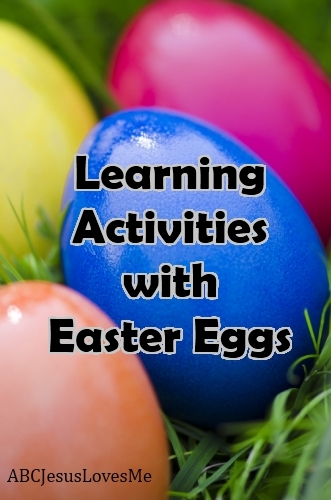 • Ideas using Easter eggs to aid in learning math, letters, colors and while focusing on sensory and gross motor skills. Letters - Write the capital letter on one half of the egg and the lowercase on the other. Have the child match the letters. Math - Basic hide and seek. Then have the child count how many eggs he found. Colors - Have the child seek only one color of eggs. Matching - Mismatch the eggs together. Have the child disassemble the eggs and reattach with the correct match. Gross Motor - Play catch with the egg. Group Games - Provide each group of two with a towel to hold. Play catch with the egg by tossing the egg between towels. Race - Place the egg in a spoon and race to a designated spot without letting the egg drop. Sensory - Place different items in the eggs to make different sounding shakers. (May need to tape the egg shut.) Shake with your favorite song. Gross Motor - Place miniature golf with Easter eggs and a broom. Letters and Numbers - Write a letter or number on a small piece of paper. Place instead an egg. Hide the eggs and have the child name the letter or number on the piece of paper. Fine Motor - Paint with the eggs. Open the opened egg to dip in paint to form circles. Or, roll the egg around in fingerpaint. Matching Sensory - Fill two eggs with the same item. Create several more sets with different items. Have the child shack the eggs and find the matching sounds. Science - Place various items of weight inside the eggs. Roll the eggs down a slope and compare times. Matching - Cut large stickers in half. Place each half on an Easter egg. Separate the eggs and have the child match the pictures. 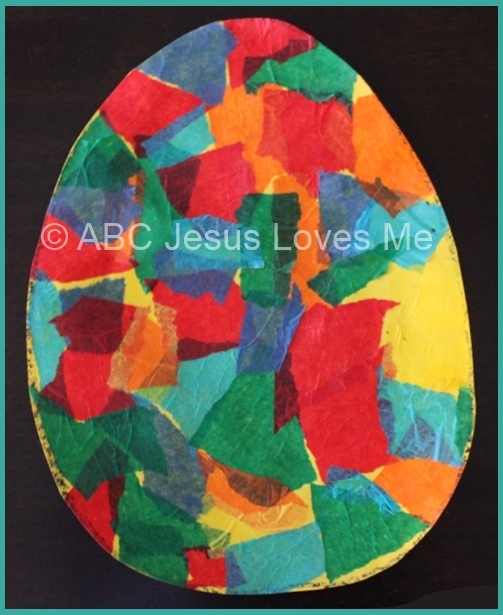 • Tissue Paper Egg - Print off the Large Easter egg printable. Paint a small section of the egg with water-downed glue. Lay torn pieces of tissue paper on the egg. Paint over the tissue paper. Continue until the entire egg is covered. Let dry. 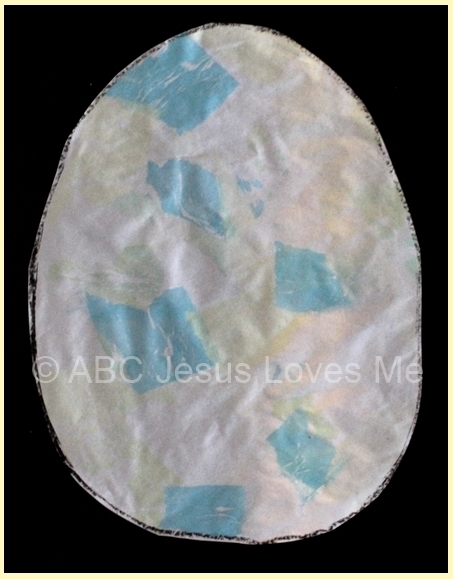 • Tissue Paper Egg - Print off the Large Easter egg printable. Paint a small section of the egg with vinegar. Lay torn pieces of "bleeding" (vs. non-bleeding) tissue paper on the egg. Paint over the tissue paper. Continue until the entire egg is covered. Let dry. Peel off the tissue paper to find a soft surprise! Here is one way to do an Easter basket without the bunny. On Friday, you discuss the cross, sin, and why Jesus died and put black rocks (or ones you painted black) in the basket. They represent sin and the sadness. Then on Easter morning, they will see their baskets and the black rocks will be gone and filled with gifts to represent the gift of life that came through the death and resurrection of Jesus! 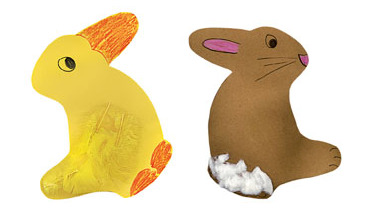 • Bunny/Duck Craft - Use this template to create a bunny or a duck. Very fun! 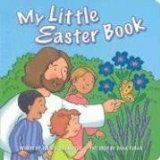 • "He Lives" Make a Scene Easter - These are great for Easter baskets, for learning time, or for a Sunday School class. 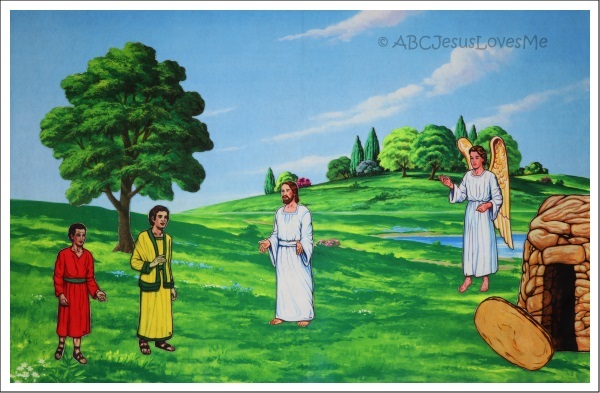 K is for Kite: God's Springtime Alphabet - A precious alphabet book that teaching children about springtime and Easter through the Letter K.
The Berenstain Bears and the Easter Story - Explains the Easter story in simple terms. pages 32-33 - He went to the cross. 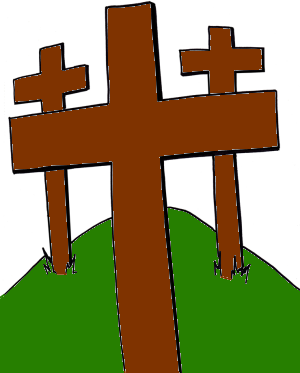 page 74 - Where did Jesus die on a cross? page 86 - Why did Jesus die on a cross for me? Buck Denver Asks: What's in the Bible? Volume Ten - Jesus is the Good News! - This video explains the Easter story better than I have ever seen. - Adventures in Odyssey: Daring Deeds, Sinister Schemes (Gold Audio Series #5) - The episode, "The Imagaination Station, Part 1 and 2" takes a character named Digger back in time to Jesus' death and resurrection. He is immersed into the historical happenings and even becomes a voice in the crowd. Being in the situation, Digger forgets the outcome of the events and fights to protect Jesus from an unfair fate. He joins the disciples and followers of Jesus as they fear for Jesus' life. In the end, Digger sees through the Easter story the sacrifice and love Jesus has for each one of us. I have always been awed by the symbolism of the caterpillar turning into a butterfly and Jesus being in the tomb and rising again. If your child is familiar with the The Very Hungry Caterpillar book, they will remember that a caterpillar eats, and eats, and eats. Then, and only God can explain this, the caterpillar begins to create a cocoon around itself. Depending on the species, a few days or weeks later, it emerges as a butterfly. 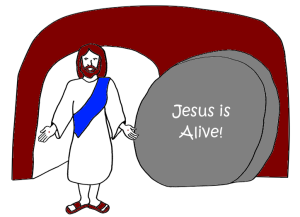 Use this example to explain Jesus' resurrection to your child. This example can also be used to explain life without Christ and then having a new life once a person has accepted Jesus as their personal Savior. Place a paper butterfly (a coffee filter butterfly works great) into a cardboard tube before the child sees it. Show the tube to the child while covering the sides of the tube with your fingers so he/she can't see the butterfly inside. Tell the child he/she needs to pretend the tube is a fat little caterpillar. Wrap your hands tightly around the tube. Say to the child, "The caterpillar wraps a cocoon around himself. Inside the cocoon it is very quiet and dark. The caterpillar stays there for a long time. That reminds me of the way Jesus stayed in the dark tomb for three days. Let's slowly count to three and remember how long Jesus was in the tomb. 1-2-3. When the caterpillar is ready, he pushes, stretches, and shakes off the cocoon." (Release the tube so the child can see the butterfly.) "And when he comes out, he looks different. Since butterflies have a new life after they come out of the cocoon, they can remind us that Jesus died for us and then rose again." I nsect Lore Live Butterfly Garden - I have never done one of these kits but the ratings are wonderful. Something we might need to try ourselves! Let me know if you have. 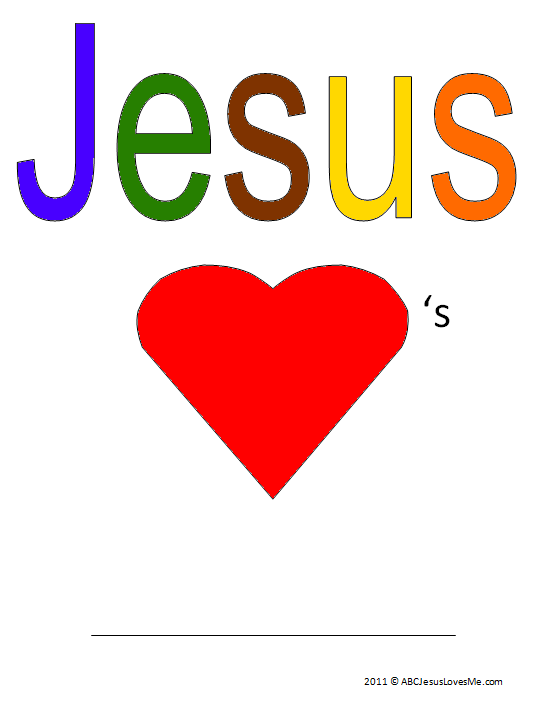 - Print the " Jesus Love's _____" title page and add the child's name to the line. Sponge paint with a heart. Add and staple or bind all of the pages together to form a book. Review the Bible stories as you look through the finished book. 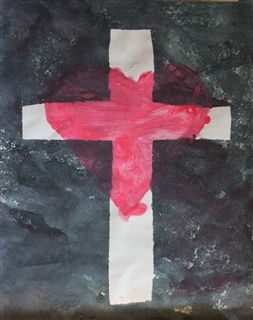 - Make a Cross and Heart Painting - Using the template , cut around the cross. 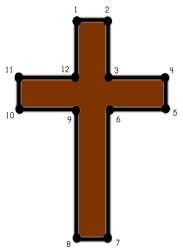 Tape the back of the cross to a white piece of paper. Using a piece of sponge, stamp around the cross covering the entire piece of paper. Careful pull up the cross. Let dry. Cut out the inside of the heart. Tape the underside of the heart on top of the cross. Place a few dots of red paint inside the heart. Lay a piece of string in the dots of paint and drag around to cover the heart. Careful pull up the heart. Let dry. - Color the Donkey poster. Glue gray yarn for the donkey's mane and tail. Glue to a piece of construction paper. 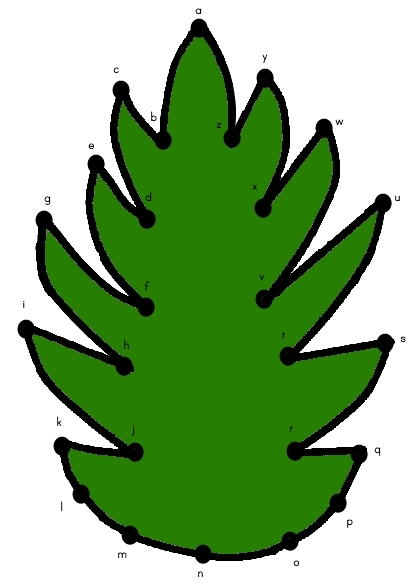 - Palm Branch: Print the Palm Branch coloring sheet. Paint the branch green and cut it out. Cut slits along the edges. Glue or tape a large craft stick or ruler to the back of the branch. Wave the palm branch as the people would have done for Jesus. - Palm Branch Art: Print the Palm Branch coloring sheet. Using thinned glue, spread a thin layer on the palm branch. Add different shades of torn green tissue paper overlapping the pieces. Let dry. 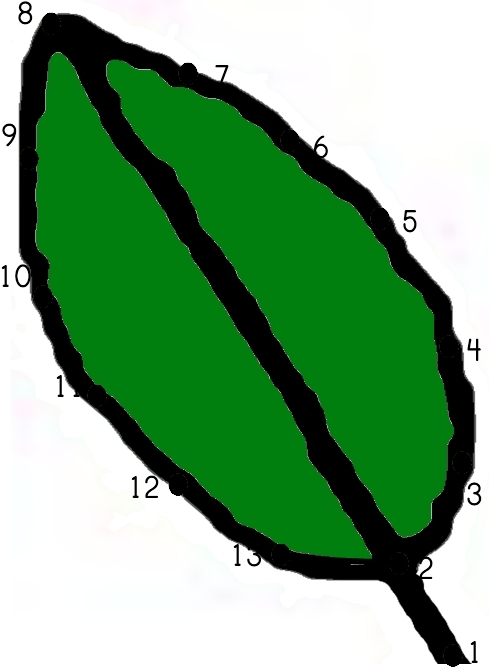 Glue along the edges and make lines for the inside of the leaf. Sprinkle glitter over the glue. - Do a Cross Dot-to-Dot with numbers 1-12. 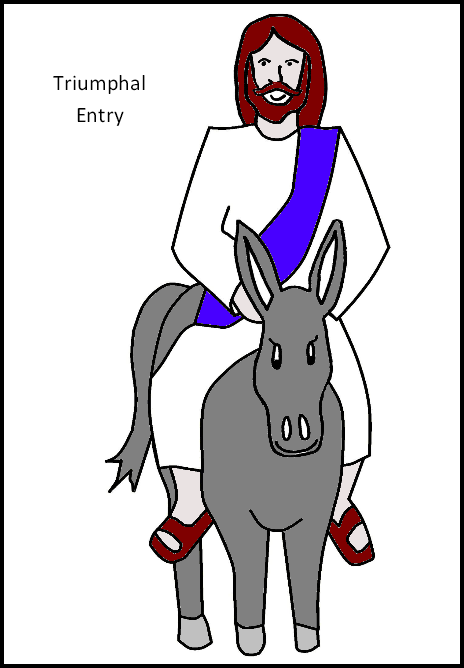 - Donkey Puppet: Print the Donkey Puppet Template . Cut the pieces out on brown or gray paper (make the tongue pink). Glue the head to the bottom of a lunch-size brown paper sack. Glue legs to the sides and opening (be sure to glue the legs so that the hand will not cover them up). Glue the tongue inside the fold. Cut short pieces of brown or gray yarn and glue on for the donkey’s mane. 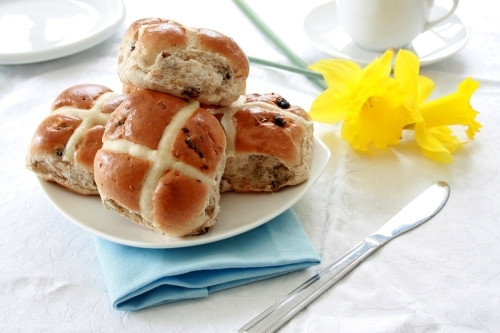 • Hot Cross Buns - Several recipes are available to make Hot Cross Buns. This one is our favorite. 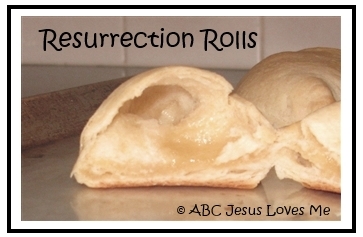 • Resurrection Rolls - Experience an empty tomb with a crescent roll and a marshmallow. • Easter Story Cookies - Honestly these are not cookies that get eaten at our home but the story is awesome! • Bird Nest Cookies - These cookies are so yummy and kids can make them without too much help! 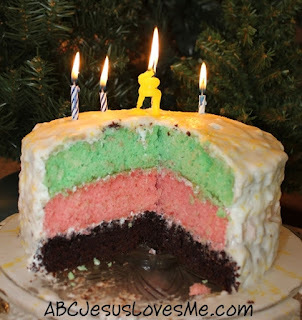 To make the colored layers - mix a white cake according to the box/recipe directions. Divide the batter in half. Drop several drops of green food coloring in one half, and red food coloring in the other half. Pour each into 8" round cake pans and bake according to recipe directions. When cooled, stack the chocolate layer, red layer in the middle, ending with the green layer with white frosting in between. Frost the entire cake with white frosting. Add yellow decorations and candles to the top. The chocolate layer reminds us that our heart is full of sin. The red layer reminds us that Jesus shed His blood for our sins. The white frosting reminds us that Jesus will forgive our sins and give us a clean heart. The green layer reminds us to grow in Christ through praying, reading the Bible, and worshiping. The yellow decorations remind us of heaven. The candles remind us Jesus is the Light of the world. The whole idea behind Resurrection Eggs is that the eggs help tell the story of Jesus' last days on earth, His death, and His resurrection. 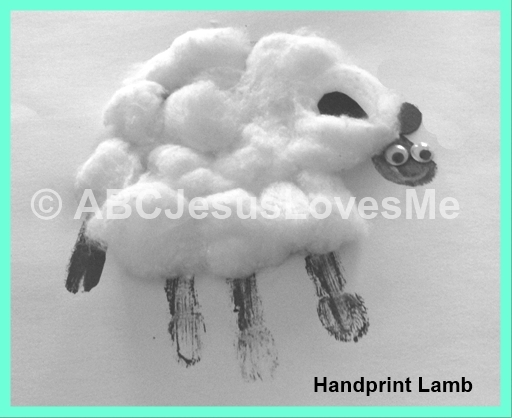 It can be completed as a countdown to Easter or as a stand alone activity that you do all in one sitting. Most numbered egg contains a scripture verse (rolled up scroll style) and a corresponding trinket that relates to that part of the story. 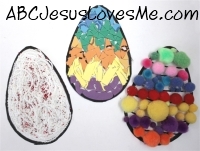 There are various forms of Resurrection Eggs available to purchase or make. Each sets contains a variation of items and order leading up to the empty final egg. Most sets contain 12 eggs but Bonnie shared an idea of 20 Resurrection eggs . 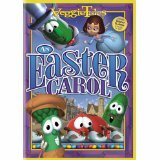 Miss Patty Cake: Eggstravaganza - Miss Patty Cake discusses the Resurrection Eggs in a section of this DVD. Place this poem in a small bag with some jelly beans. Yellow is for the sunflowers so bright. Black is for the dark of night. Orange is for the sun He made. Use this poem to create a craft or use a real basket. You can change the objects but keep the colors the same. 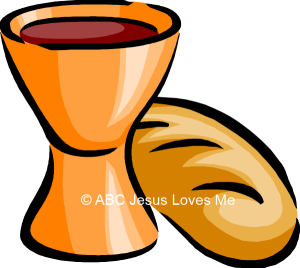 The purple flower reminds me that Jesus shared wine and bread with His disciples. 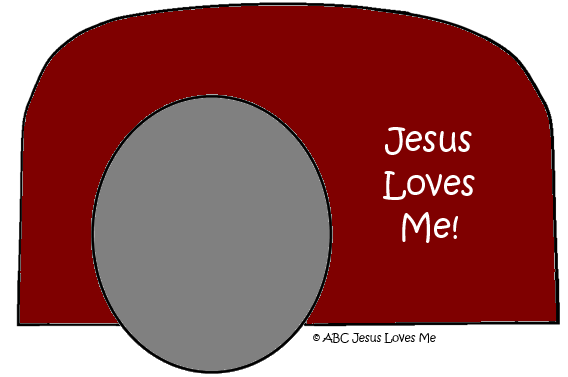 The red egg reminds me that Jesus dies for us. 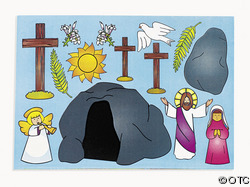 The brown bunny reminds me of the dark cave where Jesus' body lay. The white lamb reminds me of the angel who said "He's risen!" The yellow chick reminds me of the bright sun and the resurrection of Jesus on Easter day. Cut a piece of paper in half, length wise. Each 4 1/4" x 11" piece can be used to create a heart chain. (Begin the Easter story) Gently fold the paper in half, width wise. Fold again. Unfold. (Soldiers came to get Jesus.) The lines created will help you see where to accordion fold the paper. Now accordion fold the paper taking the edge of the paper to the first line. Flip the paper over and fold the width of the first fold. Continue folding until the paper is folded eight times. (Jesus is beaten and mocked and placed on the cross.) Lay the folded paper flat on a table with the first fold toward the left. Draw half a heart on the top with the center of the heart on the fold. Allow the curved part of the heart to partially overflow to allow for the hearts to be connected. (Jesus died on the cross as the punishment for our sins.) Cut along the lines (Jesus in the tomb). Open up the hearts (Jesus is risen!). Give each child a Heart Chain. Add the words "This is how we know", "what love is", "Jesus Christ laid down His life", and "for us. I John 3:16".